We are NOT a big Halloween family. We don’t decorate the house with ghosts and goblins. We don’t go to haunted houses and we surely don’t spend big money for a costume. Last year, Isaac was a teddy bear. (The costume was a loaner.) So this year, we needed to purchase or borrow a costume for our 2 year old. This is what we came up with. $1.00 at the grocery store. Is this not the cheapest Halloween costume ever? A plastic vest, toy hammer, and walkie-talkie all for a buck. Fireman Isaac will be patroling the neighborhood streets on Oct. 31 (that is if his baby brother doesn’t come that day). The funny thing is that the grocery store was running low on these $1 costumes. It appeared that quite a few costumes had been purchased by other families. Are there people out there as cheap as us? Is that possible? Trick or Treat. The hammer comes with the Bob the Builder costume. I believe firemen normally use the included hatchet. But either way, great deal…I’m sure he’ll get more than $1 worth of candy. I think you should cut the face off of the cardboard placeholder and poke some holes in it and attach a string and make the child a mask!! 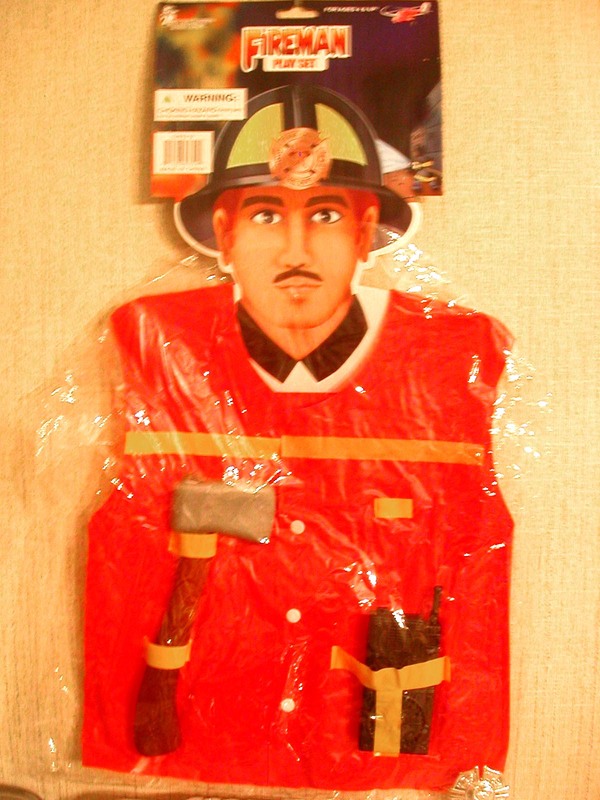 That would really set the costume apart from all other halloween costume imposters! !